미국이 지금까지 북한의 대화요청에 냉담한 반응을 보여 왔던 것과 달리 트럼프 대통령은 남북한의 대화 가능성에 대해 “좋은 일” 이라는 반응을 보였으며, 동계올림픽 기간 동안 한미군사훈련 중단에 대해서도 동의했다고 가디언지가 보도했다. 트럼프와 북한의 김정은은 최근 몇 달 동안 호전적인 언사를 교환하며 위기를 촉발시켜 온 가운데, 신년연설에서 김정은은 한국과 대화할 의사가 있으며 동계 올림픽에 대표단을 파견할 수 있다고 말했다. 한국은 다음 주 판문점에서 고위급 회담을 제안하는 것으로 북한의 회담 제안에 응했으며 1월 3일, 남북한 당국은 핫라인을 재개통했다. 한편, 빈센트 브룩스 주한 미군 사령관은 이것이 북한이 소기의 목적을 달성하기 위한 주변국간의 이질전략이라고 표현했으며 일본은 북한에 의한 안보 위기가 2차 세계대전이후 가장 위험하다며 방위력을 강화하겠다고 피력했다. 다음은 뉴스프로가 번역한 가디언의 기사 전문이다. 목요일 문재인 대통령이 트럼프 대통령과 전화 통화를 나누고 있다. 트럼프 대통령은 평창 동계올림픽에 고위급 대표단을 파견할 것이라고 말했다. Donald Trump has called potential talks between North and South Korea “a good thing” and the South Korean presidency said he had agreed there would be no military drills with South Korea during next month’s Winter Olympics. 도널드 트럼프 대통령은 남북한의 대화 가능성이 “좋은 일”이라 말했고, 한국 대통령은 다음달 동계 올림픽 기간 동안 한미 군사 훈련이 없을 것에 트럼프 대통령이 동의했다고 전했다. 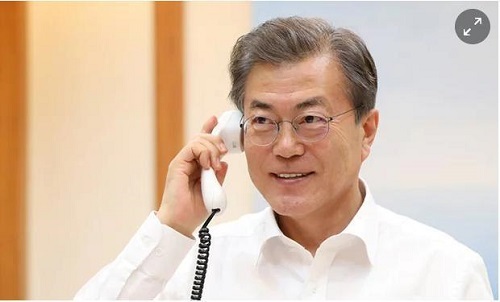 South Korea’s presidential Blue House said Trump told South Korea’s president, Moon Jae-in, in a telephone call that he hoped inter-Korean talks would lead to good results and that he would send a high-level delegation, including members of his family, to the Winter Olympics, which will be held in South Korea. 청와대는 트럼프 대통령이 문재인 대통령과의 전화 통화에서 남북간 대화에서 좋은 결과를 희망하며 한국에서 개최될 동계 올림픽에 자신의 가족 구성원을 포함한 고위급 대표단을 파견하겠다고 말했다고 전했다. In a tweet ahead of the South Korean statement, Trump hailed potential talks between North Korea and South Korea as “a good thing” and took credit for any dialogue after Seoul and Pyongyang this week signalled willingness to speak. 한국의 성명 발표에 앞서 트위터에서 트럼프 대통령은 북한과 남한 사이에 가능한 대화를 “좋은 일”이라고 환호했으며 이번 주 서울과 평양이 대화 의지를 표명한 이후 모든 대화의 공을 자신에게 돌렸다. 콜 롭 매닝 미 국방부 대변인은 훈련 중단에 관해 질문을 받고, “국방부는 트럼프 대통령의 결정과 [한국]-미국 동맹의 최선의 이익에 부합되는 것을 지지한다”고 말했다. North Korea has long denounced US-South Korean joint military exercises as preludes to invasion. 북한은 한미합동군사훈련을 침략의 전주곡이라며 오래 전부터 비난해왔다. US officials had earlier responded coolly to North Korea’s suggestion of talks with the state department, saying Pyongyang “might be trying to drive a wedge” between Washington and Seoul. 미국 관계자들은 애초 북한이 국무부와의 회담을 제안했을 때 냉담한 반응을 보이며, 북한이 미국과 한국 사이를 “이간질 하려는 것”이라고 말했다. And the head of US forces in South Korea warned on Thursday against raising hopes over North Korea’s peace overture amid a war of words over its development of nuclear-tipped missiles capable of hitting the United States. 그리고 목요일 주한 미군 사령관은 미국을 타격할 수 있는 핵무기가 장착된 미사일 개발을 두고 설전을 벌이는 와중에 북한이 제시한 평화 서곡에 대해 희망이 커지는 것에 대해 경고했다. 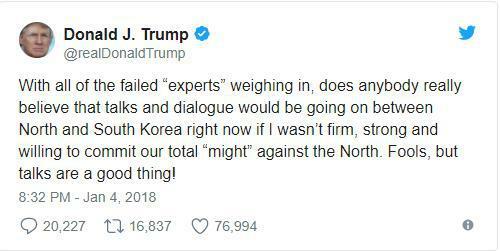 Trump and the North Korean leader, Kim Jong-un, have exchanged a series of bellicose comments in recent months, raising alarm across the world, with Trump at times dismissing the prospect of a diplomatic solution to a crisis in which both sides have threatened to destroy each other. 트럼프와 북한 지도자 김정은은 최근 몇 달 동안 일련의 호전적인 언사를 교환하는 가운데, 서로를 파괴하겠다고 위협하는 위기를 겪으며 때로 트럼프가 외교적 해결의 전망을 묵살하고 전 세계에 위기감을 일으키기도 했다. In a New Year address, the North Korean leader said he was open to dialogue with the US ally South Korea and could send a delegation to the Winter Olympics. 신년 연설에서 김정은 북한 지도자는 미국의 동맹국인 한국과 대화할 의사가 있으며 동계 올림픽에 대표단을 파견할 수 있다고 말했다. But Kim also warned that the entire United States was in range of North Korean nuclear missiles and a nuclear button was always on his desk. 그러나 김 위원장은 또한 미국 전체가 북한 핵 미사일의 사정권 안에 있으며 핵무기 버튼이 항상 자신의 책상 위에 있다고 경고했다. 트럼프 대통령은 김 위원장을 “작은 로켓 맨”이라고 조롱하며 자신의 핵 버튼은 더 크고 더 강력하고 작동도 한다고 말하며 이에 대응했다. Seoul answered the North Korean talks overture by proposing high-level talks at a border village next week, and on Wednesday the two Koreas reopened a border hotline that had been closed since February 2016. 한국은 다음 주 한 국경 마을에서 고위급 회담을 제안하는 것으로 북한의 회담 제안에 응했으며 수요일 남북한 당국은 2016년 2월 이후 폐쇄되었던 국경 직통전화를 재개통했다. The commander of US Forces Korea (USFK), Gen Vincent Brooks, said the overture was a strategy to divide five countries – the United States, South Korea, China, Japan and Russia – to reach North Korea’s goal of being accepted as a “nuclear-capable” nation, South Korea’s Yonhap news agency reported. 빈센트 브룩스 주한 미군 사령관은 이것이 “핵 능력을 갖춘” 국가로 인정 받기 위한 북한의 목적을 달성하기 위해 미국, 한국, 중국, 일본과 러시아 등 5개국을 이간질하려는 전략이라고 말했다고 한국 연합뉴스는 보도했다. “We must keep our expectations at the appropriate level,” he was quoted as saying in an address to a university in Seoul. 브룩스 사령관은 서울의 한 대학에서 행한 연설에서 “우리 기대치를 적절한 수준으로 유지해야 한다”고 말했다. North Korea says its weapons are necessary to counter US aggression. The United States stations 28,500 troops in the South, a legacy of the 1950-53 Korean war. 북한은 북한의 무기가 미국의 공격을 막기 위해 반드시 필요하다고 말한다. 미국은 1950-53 한국전쟁의 유산으로 28,500명의 병력을 한국에 주둔시키고 있다. Japan’s prime minister, Shinzō Abe, said on Thursday the security crisis posed by North Korea to Japan was the most perilous since the second world war and he vowed to bolster defences. 목요일 아베 신조 일본 총리는 북한에 의한 일본의 안보 위기가 2차 세계대전 이후 가장 위험하다고 말하며 방위력을 강화하겠다고 선언했다. On Tuesday, Nikki Haley, the US ambassador to the United Nations, said Washington would not take any talks between North and South Korea seriously if they did not contribute to denuclearizing North Korea. 화요일 니키 헤일리 유엔 미국 대사는 북한의 비핵화에 기여하지 않는 남북한 간의 어떤 대화도 미국이 진지하게 받아들이지 않을 것이라고 말했다. She also said Washington was hearing reports that Pyongyang might be preparing to fire another missile and warned of even tougher steps in response if it did so. 헤일리 대사는 또한 미국은 북한이 또 다른 미사일 발사를 준비하고 있을지도 모른다는 보고를 받고 있으며 만일 북한이 그렇게 한다면 훨씬 더 강경한 조치가 있을 수 있다고 경고했다.